We get our first view of the Queen of Naboo in the opening minutes of Star Wars Episode I — The Phantom Menace. She is wearing this regal red gown with a circular headdress. This may be the most popular outfit in which Padmé Amidala has been depicted with at least 25 Masterwork sketch cards. Although not seen in any of the sketch cards, the outfit is highlighted by lanterns around the periphery of the dress. Kimberly Dunaway is based in New Mexico. I first became aware of her work at ShowCon in Murfreesboro, Tennessee. I learned that she had done some cards for the Rebel Legion Artist Series for Star Wars Celebration VI. While I liked her work, she had no Star Wars items, or at least none of Padmé. 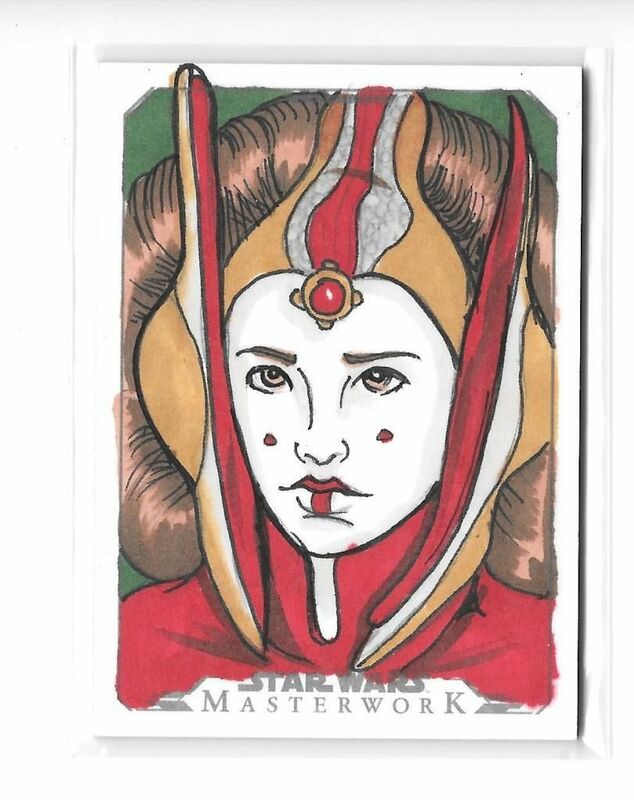 Well, she finally made several Padmé sketches for the Star Wars Masterwork cards from Topps and I have acquired nine of them including three artist returns. I won this card on eBay on February 20, 2015, and paid Edward Jurgensen a few days later.